Our domain is a family house of 40 hectares established in 1995 and built on exceptional terroirs: Tavel and Lirac. 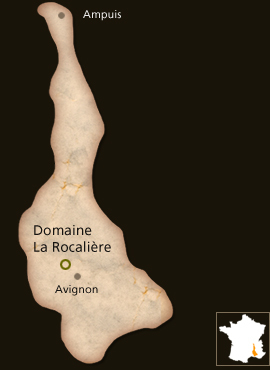 Three generations have worked to make the La Rocalière estate what it is today. Managed since 2009 by Sèverine Lemoine, the estate was founded by his father Jacques Borrelly and his grandfather Armand Maby. Since that date, corresponding to the retirement of her father, the estate has become a ‘women’s affair’ since she is supported by her sister Melanie Borrelly. We are particularly careful to keep a human-scale operation so that most of our work remains manual. This allows us a ‘mastery’ throughout the process of cultivating our grapes and making our wines or every detail is important. It is not only the result that counts, but the way to get to it just as much! Conscious of the unique potential that our predecessors and nature have offered us, our priority is to transcribe as much of the richness of our terroir as possible and to ensure its durability. – 20 hectares in the Lirac appellation located in the communes of Lirac and Saint-Laurent-des-Arbres. – 20 hectares in Tavel appellation spread over the 3 terroirs of this appellation: limestone lauzes, pebbles roulets and sands. – 2 hectares vinified in Vin de France located in the commune of Pujaut. The vineyard is planted with black grenache, mourvèdre, syrah, cinsaut and carignan for rosés and reds; With white Grenache, Clairette and Roussanne for white. The average age of vines is about 30 years. We have worked both vineyards in goblet for over 40 years, and recent plantations are established on double wire. Our parcels, scattered over the four communes of Tavel, Lirac, Saint-laurent-des-arbres and Pujaut, are vinified separately. Each of them expresses something different. Being able to draw on the knowledge gained from each of these terroirs and their diversity, allows us to develop wines every year in the spirit of the house. Without the will to erase the vintage effect or to standardize the wines but on the contrary with the determination to get the best of the potential of each. The starting point is given with the pick-up date of the parcel. A crucial step that determines its future qualitative potential. Our vinification is done in a traditional way, and it is imperative for us to be as respectful as possible of the grapes that produce the wine. This means: the least pumping possible, very gentle pumping during alcoholic fermentation, no aggressive extraction work … If the grapes have been matured as they should be, the work in the cellar is only an accompaniment To its transformation into wine. This is our whole state of mind: to reveal our terroir in its purest and simplest expression. The Tavel is loaded with cherries and raspberries. The wine is extremely fresh and has a nice complement of minerals and spices in the finish. Vineyards are situated on terraces of pebbles, sand/clay and slate/white sand (the 3 soils of the appellation Tavel). Mediterranean with mild winters and hot summers. Our region is marked by the presence of the mistral, a corridor of wind northwest to north, very cold in winter and hot in summer, which wicks away moisture and cleans up the vineyard. Our Tavel 2014 was achieved thanks to a short cold maceration (about 24 hours). This allowed us to extract a maximum of aromas and obtain its beautiful ruby ​​color. The fermentation was carried out at low temperature (between 13 ° and 18 ° C). The grapes were vinified separately with the utmost care, and they each bring their typicality: Grenache brings boldness and fruity quality; Cinsault – fineness and length; Syrah and Mourvèdre contribute a beautiful color and red fruit flavors, as well as a superb longevity to the wine. In summer, chill our Tavel to enjoy as an aperitif. It goes well with white meats and fresh cheeses, and places special value on Provencal specialties like brandade and tapenade, etc., as well as Provencal and Asian cuisine. To appreciate the best qualities of our Tavel , please serve it between 12 ° and 14 ° C.
The nose is subtle and elegant with beautiful floral aromas such as jasmine, honeysuckle and verbena. On the palate, the wine is rich and round with citrus notes which bring a wonderful sensation of freshness. The vineyard is located on terraces of rolled pebbles. Mediterranean type with mild winters and very hot summers. Our region is marked by the presence of the Mistral, a northwesterly to northwesterly wind, very cold in winter and hot in summer, which wicks away moisture and cleans up the vineyard. Our white Lirac in 2012 was achieved through a low temperature fermentation (15 ° C to 18 ° C). We advise our white Lirac alone as an aperitif, with just seafood but also to accompany more elaborate dishes like asparagus, risotto or crayfish. To appreciate the best qualities of our white Lirac, please serve between 10 ° and 12 ° C.
Our red Lirac offers floral and spicy bouquet reminiscent of scrubland. It is powerful, full-bodied and finished the crisp and rich Grenache. For our red Lirac 2012, it started with a cold maceration of about 48 hours to extract the best all its aromatic capital. Once that was done, the alcoholic fermentation has started. Fermentation was extended after the end of the fermentation to last a total of one month. A breeding tank a year is taxed before bottling. It pairs perfectly with the spirit of contemporary cuisine: roasted farm chicken, beef tartare or carpaccio. To appreciate the best qualities of our red Lirac, it is recommended to serve between 15 ° and 17 ° C.
Knowing it is a wine that matures with age and in respect to its structure, it is to be enjoyed within the next 6 years.